Jaipurites! This amazing little cafe is offering 4 course meal for 2 at just INR 649 and we've set our weekend scenes!! Jaipurites! This amazing little cafe is offering 4 course meal for 2 at just INR 649 and we’ve set our weekend scenes!! 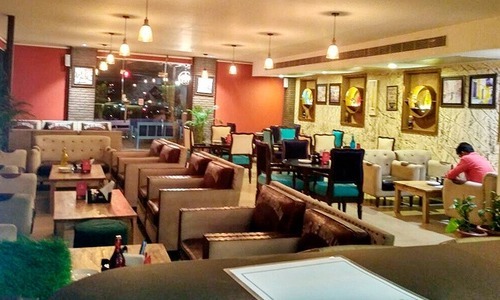 On the way cafe located in the sprawling and thriving area in Tonk Road, Jaipur is just the place to be, to enjoy a wonderful wholesome meal. Not only is the ambience peppy and modern but it also has a wide rooftop seating which is great for large parties. The cafe is known to have yummylicious food and the atmosphere is fun. Along with the fun factor the cafe also has attractive deals and discounts that doesn’t fail to surprise. Click here to get your 4-Course meal for 2 at mere INR 649! Hurry ’cause good things never wait. The best part? The mad offer that they have. The cafe is giving out a four course meal for two people, which includes : two Soups / Soft Drink, one Starter, one Main Course, one Dal, Unlimited Breads, two Scoops of Ice Cream just for 649. Now thats a steal that anyone would be willing to engage in. There is another offer for 3 people for just INR 799. Click here to get your 4-Course Meal for 2 at just INR 649! We know what craziness this offers!! This cute cafe also is known to come alive at night as the area and the cafe is packed with lively crowds that the staff love to host. The hospitality is courteous and the rooftop view is both soothing and exciting to stare at while munching on the goodies that comes straight from their kitchen all hot and fresh. So get all your friends and family out and cancel al your other plans as you hurry up and head to On my Way Cafe. Hurry up as the offer is valid only till 3oth May 2018. Previous Post WeekendBlues? This stress-bursting spa is offering 50% off as an early bird offer and we just couldn’t say no!!! Next Post Wassup Gurgaon! Beer And Starters For INR 199 At This Happening Leisure Valley Pub Is Surely Setting Our Scene For The Evenings! !